Who Is James I. Robertson? I have always puzzled over Robertson’s role in the academic world. In fact, even though he teaches at a university, he really does not fit in the mold of “academic,” that is to say, he doesn’t go to many or any academic conferences, has no real record producing graduate students of note, etc. Seems like he carved out a niche for himself long ago as the guardian of Confederate mythology, and has never been taken to task by his academic fellows. I’m not saying he was wrong to do so, I just have always found it curious. I found John’s suggestion that Robertson is best characterized as a “guardian of Confederate mythology” to be worth pursuing. A few quick points before proceeding. It is important to keep in mind that Virginia Tech, where Robertson teaches, only has an M.A. program; a number of their students have entered top-notch PhD programs and onto successful careers in the field. Robertson is responsible for a number of them. I too have never seen Robertson at an academic conference, but I would never hold that against anyone as I often find myself second-guessing a decision to travel to one of those dog and pony shows. No doubt John speaks for many in his characterization of Robertson. I’ve speculated on this blog as to why Robertson was so enthusiastic about Ron Maxwell’s Lost Cause-inspired Gods and Generals or his more recent endorsement of a book about Stonewall Jackson’s relationship with his slaves and local black population. In the case of the former I’ve never come across a statement from Robertson re: his involvement and/or a rationale for his enthusiasm for the movie. [If you have a reference feel free to pass it on.] I was much more disturbed by Robertson’s decision to write a preface for a book that characterizes the relationship between Jackson and his slaves as one of friendship. It smacks of the very same paternalistic arguments that the slaveowners themselves used as well as later historians such as U.B. Phillips and others in the Dunning School. 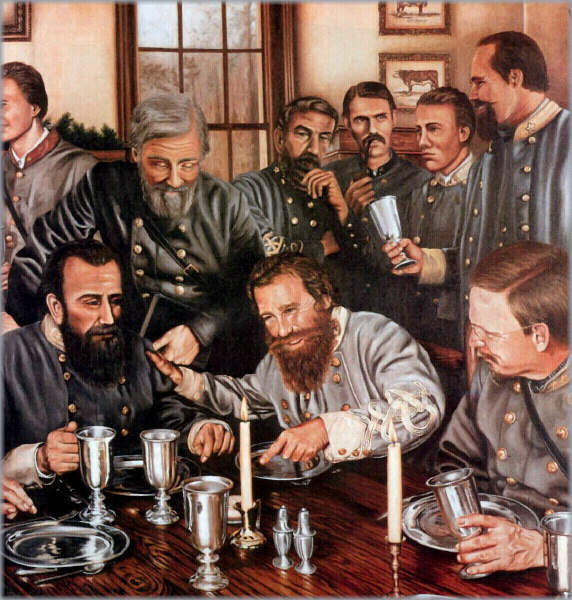 Others have characterized his award-winning biography of Stonewall Jackson as overly wedded to the Lost Cause tradition. I actually have little to say about this. Robertson published the book with a popular press and my sense is that there is enough there to satisfy the demands and interests of the academic world as well as the general reader with a more traditional bent. There are sections that I find frustrating and troubling, but in the end I learned a great deal about Jackson. Actually, I much prefer his biography of A.P. Hill (Random House, 1987). The perception of Robertson as someone who aligns himself too closely with neo-Confederate types stands in sharp contrast to his role as second executive director of the Civil War Centennial Commission. Robertson was brought in, along with Alan Nevins as chairman, to salvage the centennial following an inauspicious beginning which emphasized entertainment over education and scholarship. More importantly, the national commission had all but ignored issues of race and emancipation as an integral component of commemoration. Robert Cook details Robertson’s participation during the Centennial in his new book, Troubled Commemoration: The American Civil War Centennial, 1961-1965. It is important to remember that Robertson worked as a doctoral student under the direction of Bell I. Wiley. Wiley was involved in the the planning of the centennial from the beginning and pushed vigorously for organizers to focus on education and for it to deal with issues of race. His suggestions initially fell on deaf ears, but his promotion of Robertson to replace Betts served in part as a vindication of his own agenda. Robertson was ideal for the position, according to Cook. He was enthusiastic in his support of activities for the commemoration of the Emancipation Proclamation, but Robertson also hoped to keep attention focused on the past rather than on the ongoing Civil Rights Movement. In this sense, Robertson’s southern credentials proved to be ideal as he was both able to encourage a more inclusive commemoration program as well as assuage the concerns of southern state commissions which had expressed concern about the national commission’s political agenda from the beginning. Unfortunately, by the time Robertson and Nevins took control of the national commission interest throughout the country was declining, in large part because of the Civil Rights Movement. Robertson has done more to bring the Civil War to the general pubic than anyone in recent years. His books are read by both academics and more casual readers and his Virginia Center for Civil War Studies does an excellent job of educating high school teachers. I honestly don’t know how to explain the relationship between Robertson and the various neo-Confederate groups that he spends so much time with. Given all that he has accomplished, however, I’m not sure I really even care. Seriously, though, you’re absolutely right that Tech only has a master’s program in history, which is why Robertson’s students aren’t so readily apparent. To answer the earlier charge of him being a “guardian of confederate mythology,” I don’t see Prof. Robertson passing along much mythology in his work, though. What of _Soldiers Blue & Gray,_ _A.P. Hill,_ _The Stonewall Brigade,_ or _Stonewall Jackson_ is “mythology?” Perhaps those who heard his appearance on Civil War Talk Radio can identify the portions of his interview where he passed on mythology. Perhaps those who have seen him on C-SPAN’s BookTV can identify mythology he’s passed on. Or maybe viewers who saw his many appearances on “Civil War Journal” on the History Channel and A&E can identify mythology he’s passed on. I missed it when I saw/heard each of those. I’ve heard him speak a number of times, in addition to having sat through his Civil War History class many years ago, and I don’t recall any confederate mythology. If he doesn’t go to academic conferences, perhaps because he’s busy with teacher workshops in Virginia, or traveling to give presentations elsewhere. Perhaps he feels that educating people on the war is a better use of his time. I can’t speak to his foreword for the newer Jackson book, since I haven’t asked him about it and I haven’t read what he wrote, but we do know he has a soft spot in his heart for Jackson, and I think he can show where Jackson did, paternalistically, seek to look out for the welfare of his slaves, since he saw it as his Christian duty to do so. I agree characterizing him as a “friend” is going well overboard, though. Regarding the movie “Gods and Generals,” Ron Maxwell used Prof. Robertson’s biography of Jackson as his primary source for the Jackson character, and I think Maxwell’s attempt to get Jackson right earned Robertson’s help. That’s just speculation on my part. I think your comments on Robertson are pretty much on target. You seem certain Robertson was wrong about Jackson and slaves. What research have you done to base this on? I eagerly purchased the Jackson biography when it came out, and it’s always been one of my favorites. When I met Dr. Robertson at a seminar in Raleigh, NC, a few years ago, he was nice enough to sign my copy. He gave a great talk that night at the NC Museum of History. I also learned awhile back that he was a major player in the Virginia Battles and Leaders series that H.E. Howard published. Apparently several of the authors were students of his. I have also wondered about Robertson, and Krick (The Elder) dealing with these issues of race and memory. IMHO, it seems that both Robertson and Krick (The Elder) are taking up the mantle of Douglas Southall Freeman with their emphasis on the Eastern Theater and Confederate command structure. I pretty much agree with Cash. Indeed about a month ago I spent a week on the river boat Delta Queen, the both of us giving talks on the war, and I can reaffirm with evidence that it’s just silly to think of him as a “guardian of Confederate mythology.” He worked on Gods and Generals because Maxwell and Duvall asked him to do so–my impression is that the original script was a lot worse–and I think he likes the portrayal of Jackson. Finally I used to see him at academic conferences all the time; it’s only in the last few years that he’s been absent. He is pretty darned busy with other things, and he’s service-oriented enough to not want to turn anyone down. Let’s not forget that he is also an Anglican lay priest and until recently was an ACC football official. I’m also glad you picked up on his work on the Centennial. You should check out as well Michael Kammen’s comments as well, in _Mystic Chords of Memory_. I haven’t read Cook yet–we’ve chatted over the years–but I gather Kammen’s take is even more positive on Robertson’s determination to make the Centennial an event for all Americans while keeping it from shattering into two separate events. I’ll confess I’m biased, but over the years I’ve come to regard Bud as one of the finest scholars and gentlemen I’ve met. As far as I’m concerned, he can do what he wants. These are interesting comments, including Kevin’s post in response to my questions about Robertson. My original post was not an attack on Robertson, so it’s a bit curious if not silly for others to claim that they are defending him. I have met Robertson several times, and find him an agreeable man. I was unaware of his influence on grad students who go on to get PhD’s so that is nice to learn. And not going to academic conferences doesn’t make anyone less of an historian, as Kevin notes. However, it does bring us back around to my main point in the first place–the fact that a productive scholar at a major research institution and a writer with major name recognition seems to have carved out an interesting niche for himself as something of a public (dare I say, popular) historian in an academic setting. I’m glad much of this niche concerns teaching, which in my experience to date, gets second place to research/awards/fellowships/not teaching. He should be–and has been–commended for that. I just met Dr. Robertson yesterday (3/24/16), My impression is that he is a gentleman, scholar, and wonderful speaker. His talk entitled, “The Road to War and What We Have Forgotten” was a fantastic talk about why it is of the utmost importance we understand our history. He drew facts from American History for the years before the Civil War that illustrated the point that a lack of national leadership and the refusal of politicians of the 1856 to 1861 time period to seek compromise, compromise being a cornerstone of democracy, is being played out today as we move to November 2016. I have read his books, seen him in countless video clips, and feel confident in describing him as an ultimate teacher and historian. He is neither a supporter of the “Lost Cause” nor a detractor of it. That makes him atypical among historians today. I for one have tired of opponents and proponents of this ilk. Thank God there is a Dr. Robertson, a true teacher void of the snobbery that surrounds so many historians today!